At GoodSheetMusic.com we offer a specialist service for players of wind instruments - especially flute, oboe, clarinet, horn and bassoon. We have music for solo instrument (with or without accompaniment), for wind ensembles and for mixed ensembles. As an amateur horn player I have noticed that the opportunities for browsing music have reduced with the closure of many high street shops. 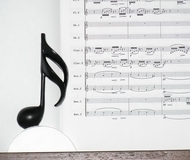 At GoodSheetMusic.com we offer the chance to look a little closer at music we hope is of interest to wind instrument players. Our music is sourced from a variety of places including music shops which have either closed or decided to reduce the range of music they offer. We also purchase previously owned collections of wind music. All music is in stock and we aim to dispatch within 24 hours. Unfortunately we are unable to offer an ordering or tracing service for music not listed on the website. Each piece is assessed as either 'Unused' or 'Used' - and includes a more detailed description of its condition. Please read the description carefully to avoid disappointment. 'Unused' - includes music which is in 'mint' condition and also includes music which may show some sign of shop shelf wear (e.g. minor scuffs on the cover or page edges). Please see the description of each individual piece for these details. 'Used' - the music shows signs of having had a previous owner (e.g. page wear, performance markings, owner's name on the title page, etc.) Again please see the description of each individual piece for details. To save space we use instrument abbreviations when listing the parts included with each piece - see the 'Abbreviations' link at the top of each page for details. Within the listing for each item are images of the cover and of a sample of the music to give a flavour of the piece. To zoom into an area of the image just hover the cursor over it or click on the image to open it in an enlarged window. Each piece is individually photographed so what you see is the actual music you will receive if you decide to buy. In addition to Lydia Lyre, Sammy Semiquaver sometimes puts in an appearance to assist in holding down the pages - Lydia and Sammy are not for sale! 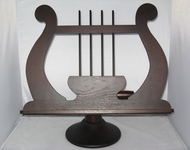 Availability: for the majority of pieces of music there is only 1 available in stock. A situation may arise where more than one person has placed the same item in their basket at the same time. It is at the point of payment at the checkout that the purchase is secured. If you are unlucky and someone else has got in just before you at the checkout, you will not be able to purchase the item concerned. Any other items in your basket will be unaffected, although please check the effect that the removal may have had on your postage charge.